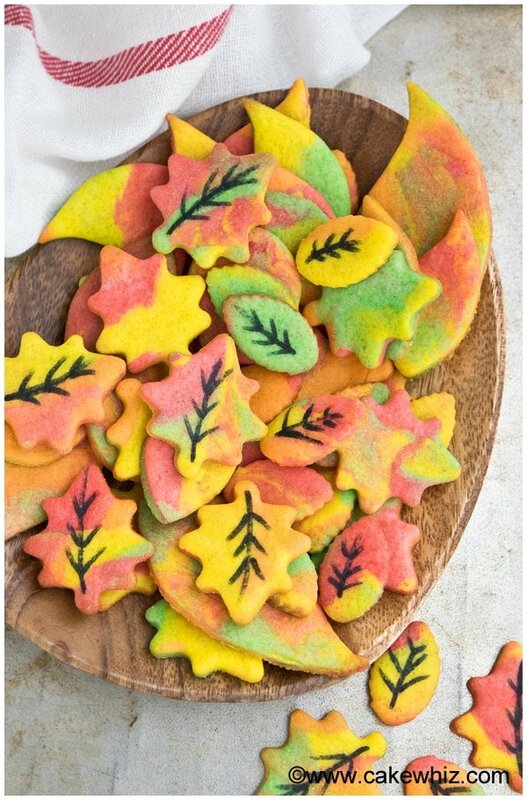 Use this step by step tutorial to learn how to make easy Fall leaves sugar cookies. You just need tinted cookie dough and edible markers. Kids can help too! Making these Fall cookies have been on my BUCKET LIST ever since I saw them in a magazine a few years ago. Since Fall is officially here, the timing was PERFECT. These are the EASIEST Fall cookies I have ever made. You just need colored cookie dough and black edible marker! NO need for marshmallow fondant or even royal icing for these Fall decorated cookies. I HATE when those leaves start falling and flying everywhere! These Fall sugar cookies are CRISPY and CRUNCHY. You can add your choice of flavorings and extracts but my FAVORITE is pumpkin spice for this time of the year. Best of all, you can get your kids involved and they can help out too. How to decorate Fall cookies? How to make Fall cookies? 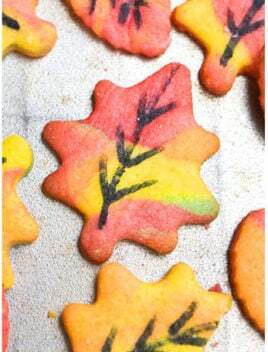 These Autumn cookies are very SIMPLE to make. Start off by preparing the sugar cookie dough. Divide the dough into 4 portions and tint them red, yellow, green and orange. Break off small portions of each ball and randomly stick them together. 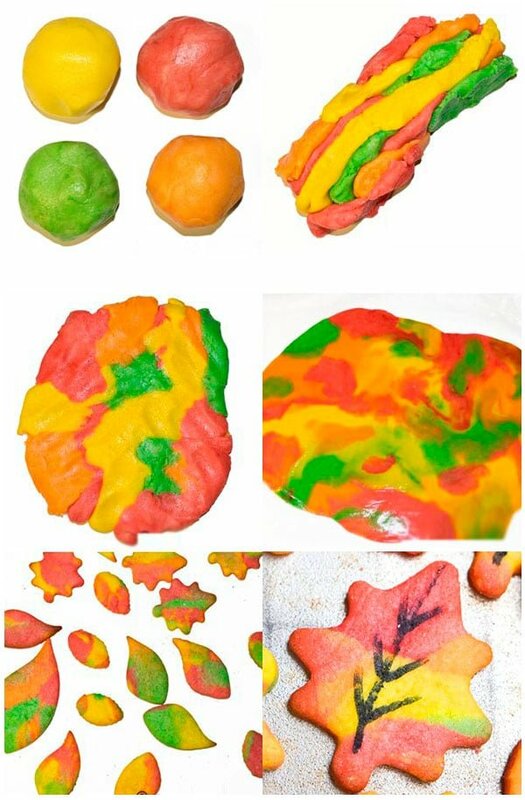 Place this colorful dough on a sheet of wax paper. Place another sheet of wax paper on top of the dough. Flatten in with a rolling pin. Use leaf cutters to cut out pieces. Bake. Allow the cookies to cool down. Decorate details with black edible marker. Enjoy! 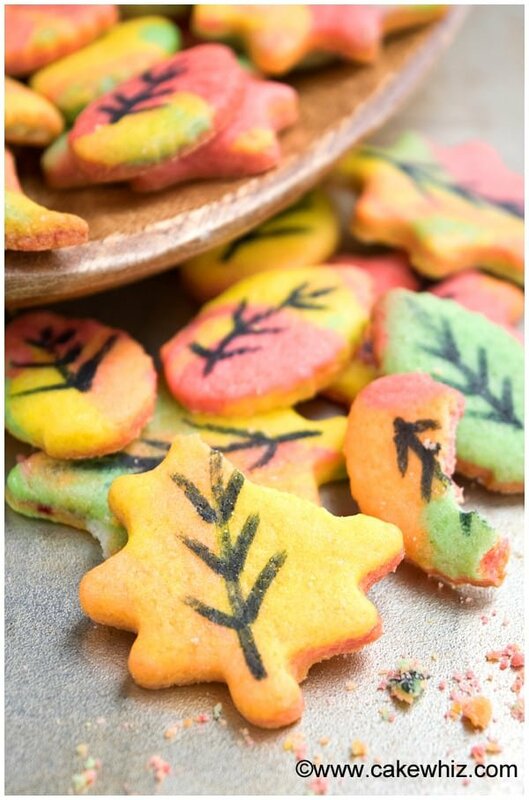 Quick and easy Fall cookies (leaf cookies) made with simple ingredients. These homemade decorated Fall cookies are great for Autumn or Thanksgiving parties. Prepare your sugar cookie dough. Use red, yellow, orange and green gel colorings to tint each ball. Break off small portions of each ball. Randomly, start sticking them together until you have something that looks like a colorful log. Use the palm of your hands to flatten this colorful log piece. Place this flattened dough on a sheet of wax paper or parchment paper. Place a sheet of wax paper or parchment paper on top of the dough. Use a rolling pan to flatten out the dough. Use leaf cutters to cut out shapes. Bake at 350 degrees for 6-8 minutes or until the cookies are golden brown along the edges. 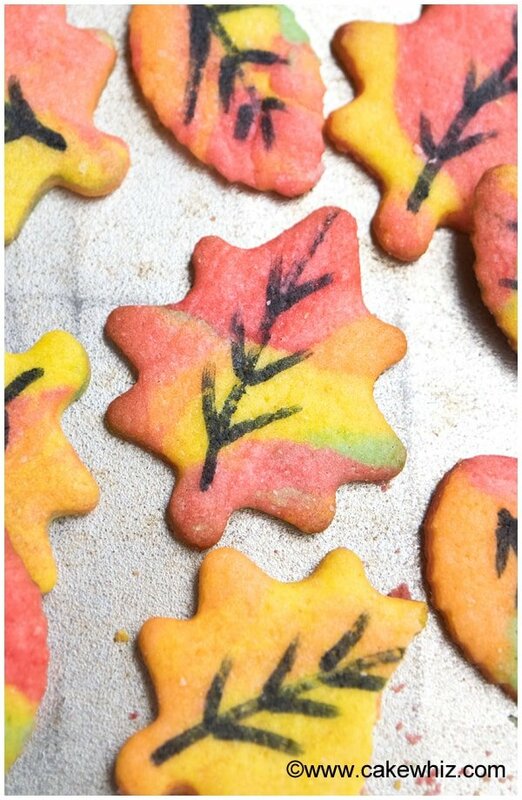 Once the cookies cool down, use a black edible marker to draw details on the leaves. Enjoy! These cookies have been on my bucket list forever too! I even bought the leaf cookie cutters two years ago, but never made them. I will definitely be making them this year for Thanksgiving! So cute!!! You have got to make them! They are sooooo much fun and definitely use gel coloring. That makes the leaf cookies so vibrant! Wow, how awesome and easy are these. I made a similar recipe years ago but mine were not so colorful – plus I made them from scratch. Mywould love these! So beautiful!!! 🙂 I bet they taste yummy too.